While spring is just around the corner, I find myself still stuck in Winter mode. I love wrapping up in warm jumpers and chunky scarves, considering it was snowing a few days ago, who can blame me! 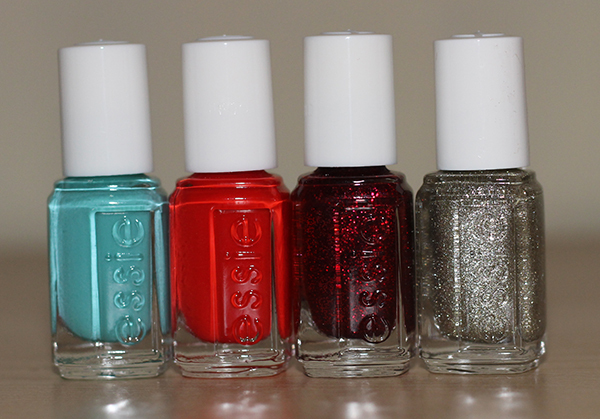 Another thing I love about winter is all the new nail polish collections that come out and this time, it’s the Essie Winter Collection. It’s a step away from dark purples and black shades which you'd normally expect from a collection. This time it features my two favourite colours, red and blue, plus two glitter polishes to add extra glam to your nails. Where’s my Chauffeur - A sort of aqua blue shade which is quite hard to find in my opinion. Looks great if you want something a little less dramatic this winter and is a great transition colour to spring. Snap Happy - A bright bold red which looks great on pretty much everyone. I think everyone should have one of these in their collection. Leading Lady - I’ve been loving my glitter polishes lately and this one is a definite favourite. I love that you can apply this alone on the nails without a colour underneath as it’s tinted red. It’s also a pretty good dupe for the Deborah Lippmann Razzle Dazzle nail polish. Beyond Cozy - Is a gorgeous, champagne glitter polish which would look great on the accent nail, possibly teamed up with Where’s my Chauffeur! I think this little set is a great way to try out a variety of Essie nail polishes without having to buy the full sized bottle. This collection won't be around for much longer so make sure you get your hands on it before it disappears!